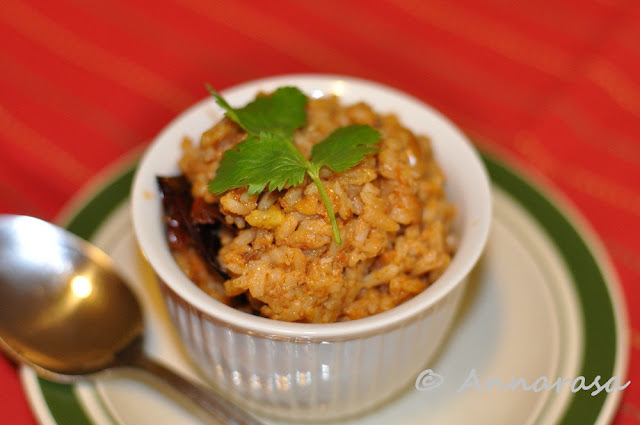 Whenever I want to make tomato rice, I hunt around for the tangy yet sweet pink tomato!! Piled high at green grocers in the big vegetable markets of New Delhi, these tomatoes were firm yet wonderfully juicy. No winter salad would be complete without them. Tomato purees and tomato paste was not widely available in those days and my Mum and Grandma made do with the fresh version for all those wonderful winter recipes. What I remember most about these beautiful tomatoes was their intense flavour which contributed to the taste of curries, chutneys, and pickles. Sadly these tomatoes are nowhere to be seen here. Once in a while I get tomatoes that actually taste like tomatoes, with the highlight being the late summer variety of Pink tomatoes that I go and pick at a local farm!! Sun ripened and delicious, they come closest to the Delhi tomatoes of my childhood. Coming to the recipe at hand, Masala Tamatar Bhaat or Spicy Tomato Rice is a classic one pot meal. It does not take much preparation and it can be made very quickly. Try getting farm fresh veggies for this one - you won't regret it!! Heat the a drop of oil in a pan. Add the cloves, cinnamon, chana and urad dals. Next stir in the red chili and coriander seeds. As they brown, add the coconut, sesame seeds, and fenugreek seeds. Turn off the heat but continue stirring the mix for a couple of minutes so that it browns evenly. Turn on to a plate and cool completely. Grind to a fine powder in the dry grinder. In the same pan, add the tablespoon of oil. Next stir in the ginger, garlic, and onions. Fry for a couple of minutes. Add the tomatoes, turmeric, and tomato paste with a quarter cup of water. Stir, cover, and simmer for 4-5 minutes. Turn off the heat and cool completely. Blend to a puree. Add the dry powder and give it a quick whirl so that the flavours are combined. In a large saucepan, prepare the tarka/ tadka/ tempering by heating the oil. Next add the mustard seeds. When they begin to pop, add the cumin, curry leaves and hing. Next reduce the heat and stir in the dals and peanuts. As they turn golden, drain the rice and add it to the tarka. Stir, then add the combined wet and dry masalas. Stir to coat the rice thoroughly. Add 2 cups of warm water and salt to taste. Bring to a boil. Reduce heat, cover and let cook till the rice is done. Turn off the heat and leave covered for another 5 minutes. This rice makes a wonderful and simple one pot meal. Enjoy with your plain yogurt. I don't think I know pink tomatoes, I am curious now!!! The recipe looks yum! Tomato rice is of my fav rice dish and whenever given a choice I make it. Your version looks lovely.